Karavshin gorge is located in Turkestan Range in Osh region of Kirgizstan. This amazingly beautiful area with clean air reminds Patagonia in South America. You will be amazed beautiful alpine meadows, glaciers surrounded by the highest peaks. Karavshin george is frequently visited by tourists and mountain climbers, as there is a number of interesting itineraries for lovers of challenging climbs. 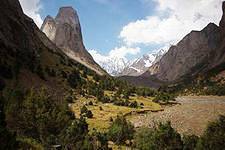 There are other gorges in the upper reaches of the valley: Ak-Su (Lyailyak) and Kara-Su. Peaks Slesova, Bird, Ortotyubek are located in the gorge Ak-Su. There are peaks Asan, Usen, Pyramid and Yellow wall in Kara-Su George. This picturesque place is unique because there are a lot of interesting routes. The road to the gorge Karavshin is first of all a sultry heat, apricot oasis, but in the end, heavenly beautiful place is waited for you.